I was homeschooled from first through sixth grade. I loved it, and I believe it gave me a lot of advantages for when I did enter public school. So I've always thought I'd homeschool as well, at least during the younger years. I know I'm in the minority, so I've been bracing myself for the lash back from educators and parents who would question my decision. I figured kindergarten age is either 5 or 6, so I had a good half of a decade after having my first child before I had to be ready for this debate. I had no idea preschool would even be an issue. I guess I thought it was optional, and really, not necessary. Kindergarten is when school starts--I mean, real school, right? So here I am with a two year old and an infant and everyone around me is putting their kids in a preschool or mother's-day-out program of some sort. And, I hate to admit this, but I panicked. I had never thought of preschool. I didn't think I had to. Since I was a stay-at-home mom, I thought I didn't need a mother's-day-out program, right? Why would I need to pay for preschool? I was staying home so I didn't have to pay someone else to raise my child. All of the sudden the line got fuzzy, and I didn't know right from wrong (for my family). So, I told my husband all of the sides of the debate and what everyone else was saying, and I asked him to pray. I told him I'd be praying and would figure out where God's leading us, then come to him and see where he felt God was leading us (big decisions like this work best when we figure out God's direction on our own, then come together to find that we're both hearing the same thing from God--we come to a decision in very different ways: my hubby spends very little time on the issue, takes a little time to pray and listen, and comes back with his answer. I, on the other hand, have to hash everything out logically, consult with people I admire, pray, listen, make pro/con lists, etc., etc., until I come to my final decision. I find it rather amusing that we both always come to the same decision but in completely opposite ways). Needless to say, when my friends (WAHMs, SAHMs, former elementary teachers, etc.) all started enrolling their children, I thought, "Uh oh. I've been missing something." So, for a little while now I've been researching and hashing out the pros and cons of preschool and trying to determine what's best for my children (Please note, I strongly believe this is a personal choice and something that needs to be decided on a case-by-case basis. I am in no way trying to determine if preschool is right for everyone. It's a personal decision just for my family). Anyway, as I'm hashing it out in my mind, I thought I'd give you a peek into my own thought process and invite you to weigh in with your own experiences/thoughts. 1. It'd give me more time to work (which is a little trickier to find this year because A is napping for half as long as she used to--so my work time has been cut in half). 2. It'd give me more quality time with my infant who's had to share me from day one. 3. It'd introduce my daughter to structure and teach her how to operate within structure. 4. It'd provide more opportunities for her to interact with other children and socialize. 5. It'd prepare her for kindergarten. 6. Everyone else is doing it. 1. I want to raise my daughter--I don't want to pay someone else to do it. 2. She's got the rest of her life to be in school. 3. I can teach/train her at home so she's not missing out on any opportunities educationally or socially (we've got plenty of options to keep her around other kids and involved in extra curriculars). 4. I don't want to miss anything. 5. Children are influenced by the people they're around, and a big chunk of that influence would now be coming from outside sources. 6. I can always make my schedule work so that I can still work at home. It'd just be different, and different is okay. 7. I'd be doing it because everyone else is doing it. There's my pro/con list so far. I've talked to quite a few people from all sides about the subject. And I've done a bit of praying. Now it's time for sorting. I need to sort all my thoughts, sift, stir, and sift some more and figure out where God's direction is in all of this. Why do I have to make this such a process all the time? If only I could be at peace with a decision I make after a few minutes of listening to God (like my husband). Well, I know why. I feel the need to have myself completely prepared to quiet the voices in my head when doubt, worry or fear start to come up after I've made the decision. I'd love to hear your thoughts on the subject. What's most important for you? I'd say my number-one reasons on both lists are really the root of my problem. When I can figure which one is more important, I'll have my answer. I'll keep you posted. **Be sure to "like" Editor Joy on FB (use the link in the righthand column) if you haven't already done so! I blinked and my baby is a toddler. I blinked again and realized all our friends have their toddlers enrolled in a mother's-day-out or preschool program. Since I've been considering homeschooling, I hadn't even contemplated a preschool program, but then my teacher friends told me the material covered in kindergarten is material I learned in first or second grade as a child. Whoa! Then I got overwhelmed and started calling preschools. After some more consulations with friends and teachers, I'm not as overwhelmed. And even though I probably won't consider any type of program until this fall at the earliest (even though enrollment is in just a couple of short weeks), I've started to change my mindset about life at home. Every moment is a learning moment. I'm not talking about draining the fun from playing, but I am talking about maximizing on teaching moments when I'm spending quality time with my daughter. And I've started to contemplate how I can incorporate more structure into our daily routine. Baby step 1: Buy a backpack. It's a small step, and it will be used for infinite possibilities, but it opens the discussion about school. Plus, it's just so stinkin' cute. When I found out I had an opportunity to review this product, I was ecstatic. Not only do I love the animal designs Skip Hop offers, but I also am a huge fan of Skip Hop products in general. My Skip Hop diaper bag is my favorite bag by far. It's like a Mary Poppins bag: you can get so much inside, and everything is easy to find and readily accessible. Needless to say, I had great expectations for the backpack. 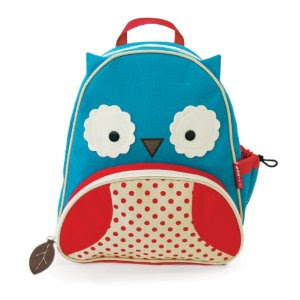 Skip Hop offers a variety of backpack designs (dog, monkey, owl, mouse, bee and penguin)--all of them are adorable. And, bonus, matching lunchies are available too. When my backpack arrived in the mail, I was just as excited as when I ordered it online--it looks exactly like the picture. (I got the dog for my nephew too). 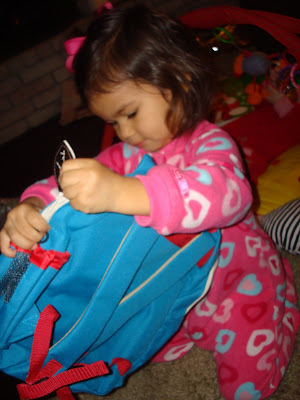 My daughter opened the backpack for Christmas, and she was excited to use it. Immediately she decided that she needed to pack food in it, so for the first week without fail, a cutie (mandarin orange) could be found in the main compartment. Since then we've used it for various outings--mostly when she goes out for the day with my mom. After a month of wear, it still looks brand new. Quality construction and excellent material (just like my diaper bag) have proven valuable. The padded straps are a great fit for my toddler, not too big or small--just right to fit on her back or carry at her side. The zippers have large decorations that make it easy for tiny toddler hands to grasp and navigate on their own. Unlike my diaper bag, it's not as roomy as I had hoped. Granted, it's made for a toddler to carry, so ten pounds of "necessary" clothing changes, snacks, pull-ups, wipes, hand sanitizer, etc., do not all fit. BUT I can easily get a change of clothes, wipes, blankie, and small cuddly toy inside. The front insulated pocket is a safe place for snacks, and the side mesh pocket for a sippy cup is also handy (it's a little small for one of our sippy cups but our Kleen Kanteen fits well). The lining is easy to wipe clean, and a good soak in the sun will keep the outside just as sanitary (but not too much sun--don't want to fade the bright colors). Not only will this backpack stand out in a pile of bags, but it comes at a reasonable price. Compared to a lot of popular backpacks available online, Skip Hop's $20 price tag undercuts a lot of the competition without sacrificing quality. And, as a mom who takes great care as to what toxins are present in my children's lives, knowing this bag is BPA, Phthalate and PVC free makes me want to hug this bag just a little tighter. **Remember, if you haven't "liked" Editor Joy on FB yet, use the button on the righthand margin to "like" it right now--and tell your friends about it too. Thanks. It's not rocket science. In fact, it's pretty logical. I first heard it on Dr. Oz, and I scoffed at the idea. But when I followed it, I found I didn't feel bloated and bulky after the Christmas season. I felt great. What is this great weight management tip for the holidays? Don't cook anything at home. Of course, I didn't follow this 100 percent, but for the most part, I did well. I didn't bake cookies, treats, or other snacky items to take to parties. Why? Because the leftovers would've been lying around the house begging me to eat them. If they weren't stacked in the fridge, they weren't tempting me. We made two exceptions for this rule: tiger butter and cinnamon rolls. The tiger butter was my hubby's project. It's wonderful but oh-so-not-healthy (so unhealthy I won't even admit on here what the ingredients are). Of course, none of those pieces of tiger butter went to waste, just to my waist. I also made cinnamon rolls. Holy mother of butter. Those were so worth it. And, believe you me, not a single one missed my waist either. I can't imagine if there had been more sweet treats lying around my home. Well, yes, I can imagine it, and I can imagine myself snacking on them during all hours of the day. So, wanna feel amazing after the Christmas holidays? Keep the food in someone else's house. It's that simple. And, be willing to buy something pre-made, so you don't have to deal with the dozens of leftovers you couldn't cram on the cute Christmas plate you took to your mother-in-law's. I'm not a big crafter by any stretch of the imagination. Yes, my mom made me take sewing and cooking lessons when I was young. Yes, I appreciate them now. Yes, I'm making way more use of my sewing skills than I'd ever imagined I would. But that doesn't make me crafty. I am a big copycat. Original craft ideas don't bloom in my head. But I can copy other people's ideas with the best of them. So, with a world of craftiness at my fingertips (i.e. the Internet), I can make almost anything. Here's the problem with being a copycat--there's so much to copy. So, this year I decided to follow the old acronym KISS (Keep It Simple, Stupid). For my friends' boys, I wanted to sew matchbox car play mats complete with roads, trees, pools of water, etc., but it would've taken me FOR-EV-ER. So, I didn't let myself start the project. 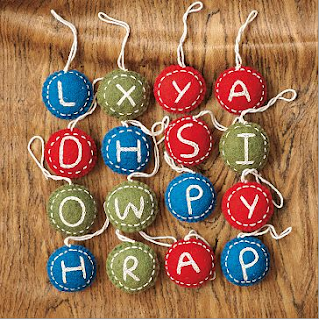 Instead I looked for great toy deals online, and I picked crafts that wouldn't take a long time. I also made hair bobbies for my girl friends. I unashamedly copied a clip I had seen in one of my favorite stores. Basically, I made a small fabric yo-yo, sewed a bead in the center, and sewed it onto a hair pin. Voila! I should've taken pictures for a tutorial, but I didn't. Sorry. My friends and family loved the presents--everyone got a little something handmade. And I pumped them all out in the time it took to watch a couple of Christmas movies after my family went to bed. Next year, it's only simple projects for me. Past that, I can find great inexpensive deals online--and those are delivered right to my door step. **Remember to "like" Editor Joy on FB too (see the right column). Thanks! 1. Most babies don't take good pictures when they're fresh from the womb. Most look like aliens, and flashes make their eyes buggy. 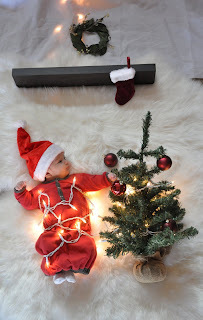 If you give them some time and wait until Christmas, they look much cuter. 2. Immediately after baby M was born, I didn't have time or motivation to take pictures, assemble a card, gather addresses, and post a bunch of birth announcements to family and friends. 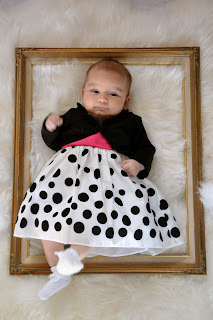 Plus, they all saw her on Facebook, which takes away from the birth announcement being as much of a necessity nowadays. 3. Postage is expensive, and I married into a HUGE Mexican family. Birth announcement done right would break the bank. 4. I'm going to spend the postage for Christmas anyway, might as well take care of the baby as well. BONUS: I don't have to be in a picture if the Christmas card is all about baby. 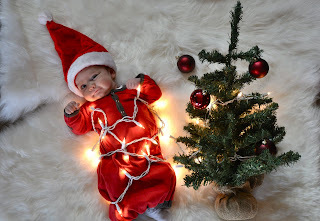 So, a friend of mine stumbled across this mother's pictures of her sleeping baby. 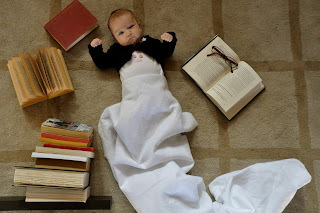 Our favorite was the bookworm. So, we got together one afternoon, popped Toy Story 3 into the DVD player for the toddlers, and set to taking pix of my little one. Here's what we came up with. And this is the one that ended up on our Christmas card--my favorite! 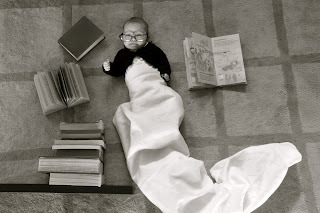 And here's our attempt to recreate the bookworm. Tee hee hee. p.s. Have you "liked" Editor Joy on Facebook yet? Use the link in the righthand margin to "like" it right now. Thanks! 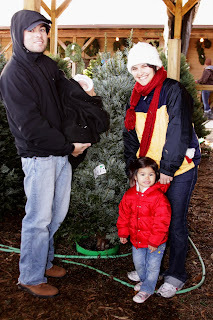 Christmas 2010 was one of the most balanced Christmases I have ever experienced. To be honest, the peace of it all caught me by surprise. 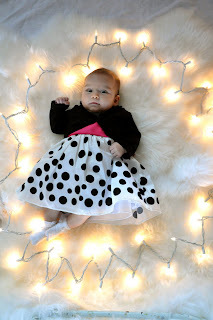 I expected hustle and bustle and holiday stress, but this year panned out a lot differently. 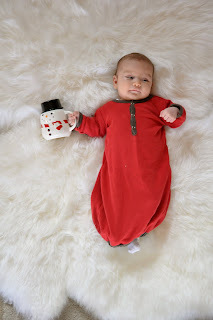 I'm devoting my first few posts back to a series I'm calling "What I Learned This Christmas." 2. Cutting down our own Christmas tree. As a child, my family would team up with two other large families, pile into an assortment of vans and minivans, and head to Eby Pines to cut down our Christmas tree the weekend after Thanksgiving. Once the trees were all piled in a trailer, the kids would perch on the sides and belt Christmas songs while we drove to the front to pay. Good times. Here in Tulsa, there's only one Christmas tree farm I know of that's relatively close. This is great for Owasso Tree Farm's business, but not so great for selection this year. There were so few trees to choose from, we opted for a pre-cut tree. Big mistake. The tree was dead and withered within two weeks. How did this take away from the stress of the holidays? Well, I was so ready to get rid of the tree that I felt no guilt when I pulled it down on December 26th. I feel refreshed when I move large objects out of my home and reorganize. Am I alone? 1. 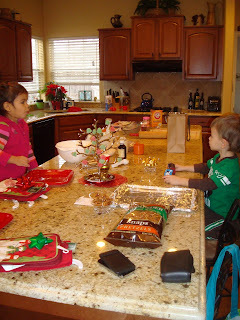 Decorating Christmas cookies with the kids at my mom's house. My mom did a fabulous job of preparing for this event (anything involving two toddlers is an event). She had three simple recipes picked out ahead of time. She had all the ingredients out (and measured if necessary). 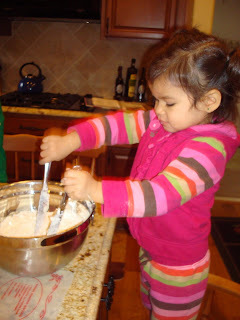 And she picked recipes that were relatively safe to eat if not cooked (my daughter LOVES to eat as she cooks. Sticks of butter are her favorite--where did I go wrong?) Baking cookies at someone else's house meant I didn't have dozens of yummy treats setting around my home tempting me to have "just one more." I know I spared myself a couple extra pounds because of this. Plus, the kids had a blast. 2. Baking cinnamon rolls from scratch for Christmas morning. I did NOT save myself any poundage with this recipe (or the piles of leftovers taunting me from my fridge). BUT these were a smash. AND I gave away a few trays of rolls as Christmas presents and scored major love and requests for upcoming holidays. We usually make pancakes Christmas morning, which I love; but we make pancakes on a pretty regular basis, so this was a new special treat. Did I mention it provided extra Christmas presents? 3. Simplifying my Christmas lists. I decided to follow Design Mom's guide for buying presents for our kids: something to wear, something to read, and something to play with. I really think this is going to help us avoid a lot of conflict or "that's it? "-attitudes later. Plus, it makes my gift-buying much more focused. And, I loved picking out a book for each girl (something I'm ashamed to admit I don't often do--we get most of our reading from the library). Overall, I found the less commitments I made, the less stress the holidays brought. 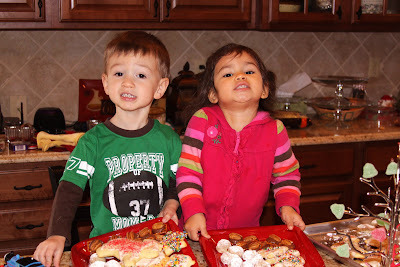 It's a nice change to have two little ones as an excuse to not attend/be invited to a lot of holiday functions. Family time is the best. Plus, since my hubby works two jobs, and his hours go through the roof in December, we cherish any time we can spend with him after a long December of only seeing his sleeping face. Despite my lack of posts during the holiday season, I have been busy dreaming about how to expand my business. One of my biggest steps is hiring a design company to create a logo for my freelance writing and editing business. Editor Joy will now be branded in your mind with my friendly smiling e. What do you think of the new look? I've started a Facebook page too. Social networking at its best, right? So now you can "like" me on FB, follow me on Twitter, and check in on my life on my blog. The blog will continue to follow my journey of being a WAHM, but I also will be adding some, ahem, nerdier posts as well. Instead of just mom and health stuff, I'll be adding some thoughts on writing, reading and editing. Give me some time, and I'll probably develop a weekly schedule so you can pick which days to check in to get the information you most desire. Here's to a great 2011! I am an editor. I do not work with a red pen. I do love grammar. I do not edit your grammar when you comment or write to me. I'm a nerd, and I'm proud of it. I'm also a wife. I'm a mom of two young girls. I'm a sister, a daughter, a friend, a confidant. I'm constantly striving to be healthier and facilitate a healthy environment for my family. I love to write. I believe readers are leaders. I also believe if you aim at nothing, you'll hit it every time (i.e. I'm a firm believer in written goals). I love to travel (I even spent two years teaching English in Japan). I'm a WAHM. I love to cook. My blog is your window into my world. I promise there is a lot more than red pens in it. What Weird Things Are You Scared Of? 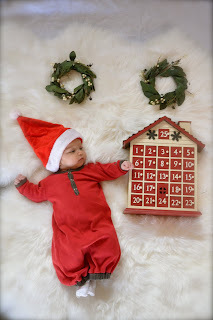 December Blog-ed-ness Has Arrived (at last)!!!! The Best of Diary of a New Mom: Now in an Ebook!